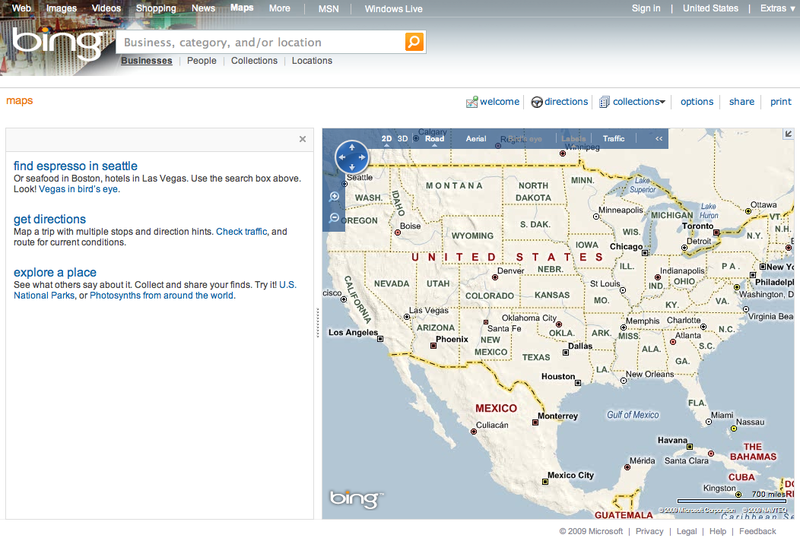 Google has released its Zeitgeist for 2009 and this year has included a list of popular local search queries from 31 US Cities. The US cities in Google’s local Zeitgeist include: Atlanta, Austin, Baltimore, Boston, Charlotte, Chicago, Cleveland, Columbus, Dallas, Denver, Detroit, Houston, Indianopolis, Kansas City (MO), Los Angeles, Madison, Miami, Minneapolis, New York, Orlando, Philadelphia, Phoenix, Pittsburgh, Portland (OR), Raleigh, Sacramento, San Francisco, Seattle, St. Louis, Tampa and Washington, D.C.
Google is surveying its Local Business Center audience for feedback to help improve its local business listings product. I took Google up on their offer and quickly completed the following four page survey. 1. 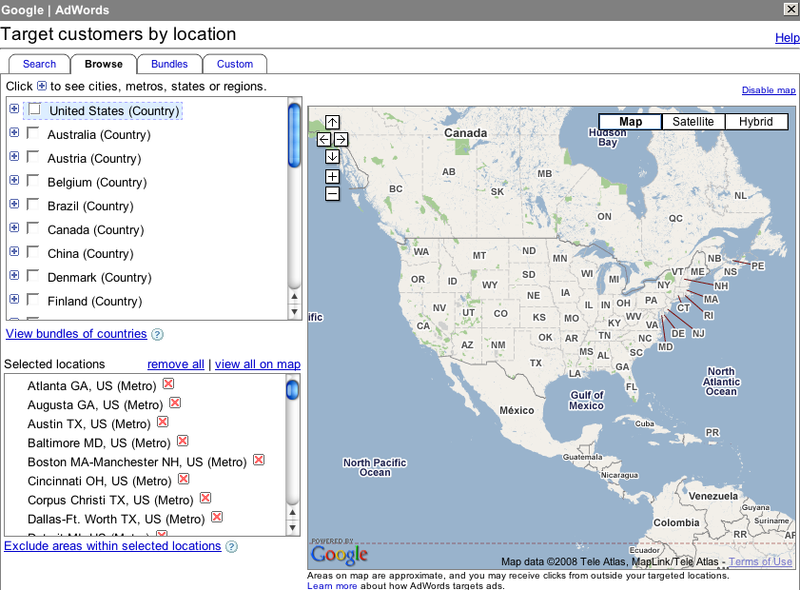 Overall, how satisfied are you with Google Local Business Center? 2. 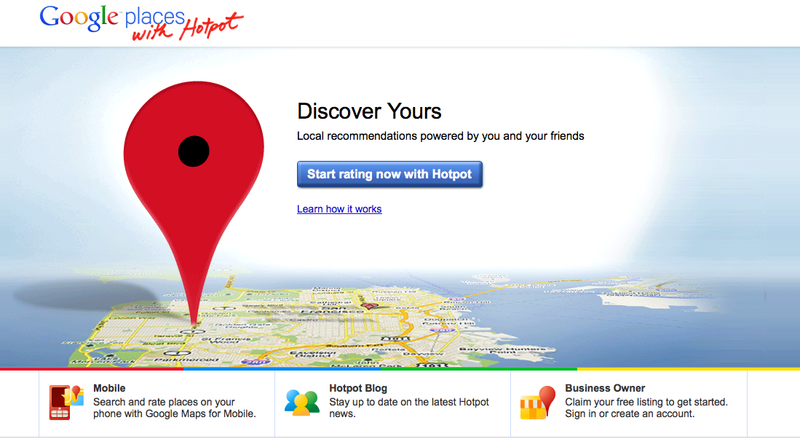 How likely is it that you would recommend Google Local Business Center to a friend or colleague? The survey then asks users to indicate their satisfaction with Google Local Business Center in the following dimensions: Ease of Use, Visual Appeal, Technical Reliability, Features and Capabilities, Trustworthiness, Privacy and Security and the Listing verification process. Which of the following answers are most important to you as a business listing manager? 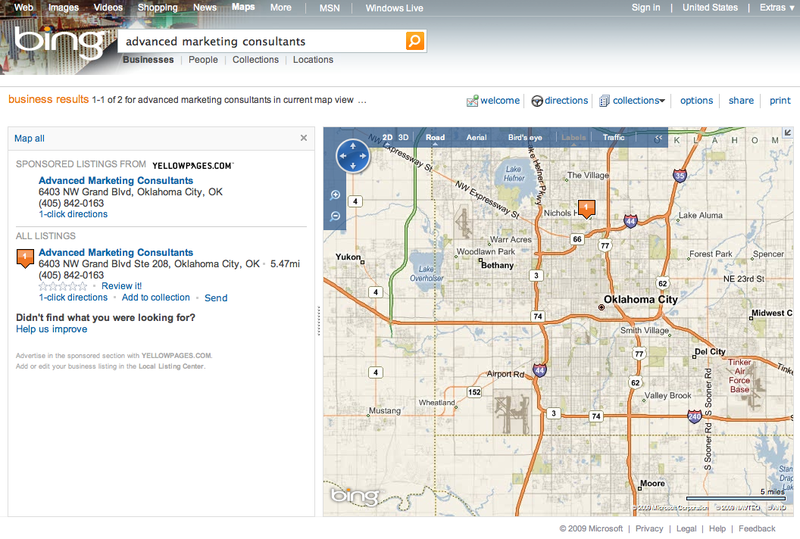 When did you first use Google Local Business Center? 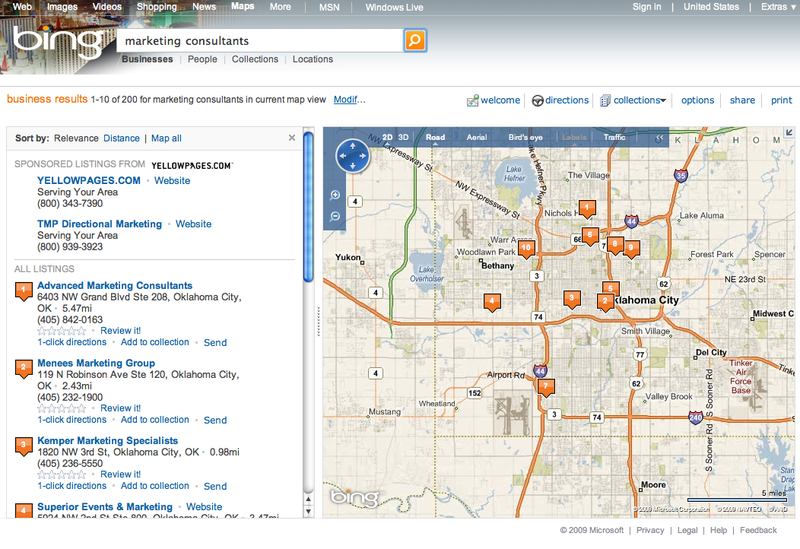 How did you verify your business listing in Google Local Business Center? 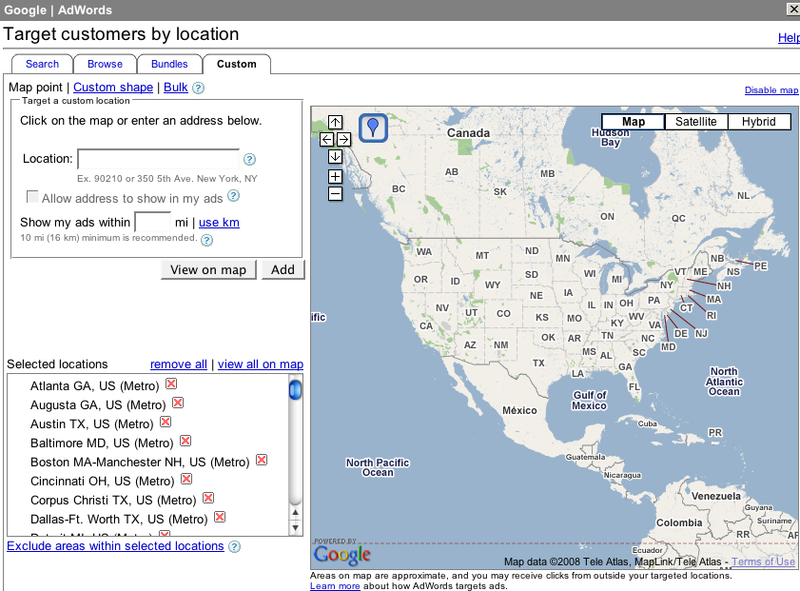 How long has it been since you last visited Google Local Business Center? Which best describes your role or roles regarding the business or businesses you have listed on Google Local Business Center? 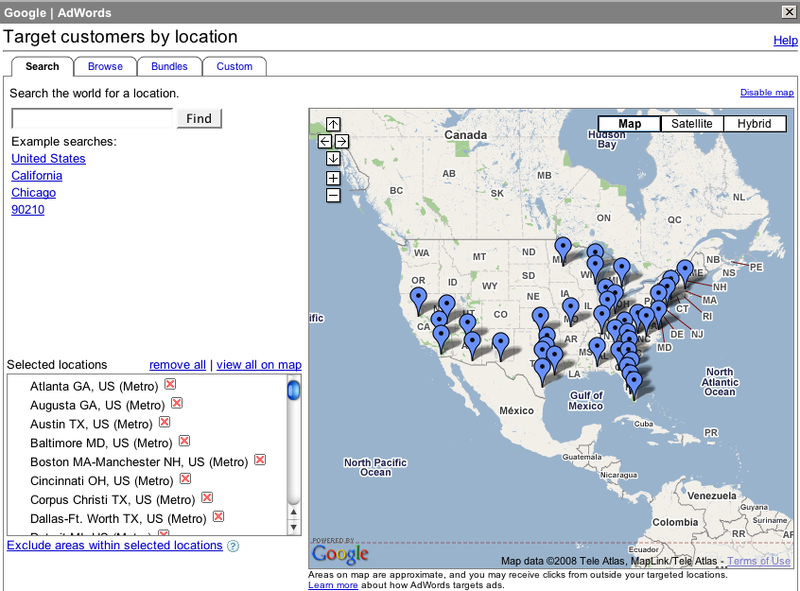 Which best describes the business(es) you are listing on Google Local Business Center? What is the preferred way for your customers to contact the business you own or manage? What are other ways you promote the business you own or manage (online & offline)? The final page of Google’s Local Business survey incorporates the users answers from the previous pages and then asks for further clarification while also asking the Local Business Center user to provide additional comments about the LBC product if they choose to do so. Uncharacteristically, the final page of the survey asked whether or not I would be willing to be contacted again with more research questions about the Google Local Business Center. I checked affirmative and then provided my email address. It will be interesting to see what – if anything – transpires from the data Google gathers from their Local Business Center Audience survey. If you haven’t received a survey in your LBC, feel free to answer any of the above questions in the comments section of this post. Today I was searching for a local french drain systems specialist to get a quote to install a drainage system in my backyard to handle the inordinate amounts of rain we have been having lately. It seems like we have been having more than our fair share of 50 and 100 year downpours this summer. On top of these once in a lifetime downpours we also had a reported 1 1/2 inches of rain fall in less than 30 minutes at the beginning of August when its typically dry as a bone. Combined the two types of rain have created problems I didn’t have before because I haven’t owned my house for 50 years nor was was it built 100 years ago. To save the time and hassle of cracking open one of the five yellow pages directories I receive annually, I thought I would see what information Google’s search results would provide. 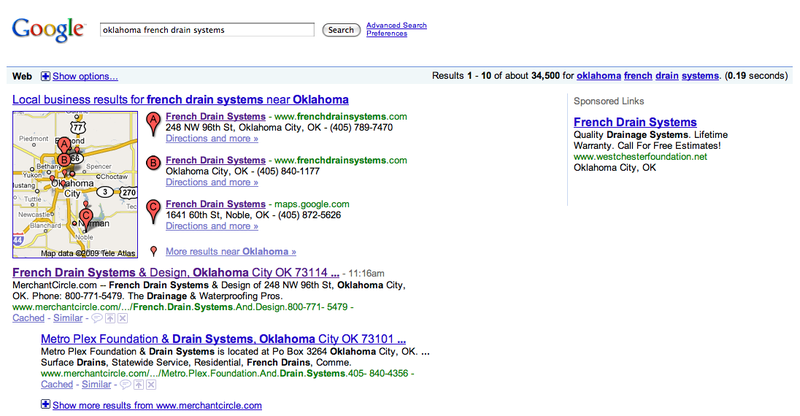 To get straight to their local search results more quickly, I searched Google for “Oklahoma French Drain Systems”. As expected, Google quickly delivered a set of three local business listings I could look over and then consider clicking or calling. Since the top two listings shared the same great relevant domain – FrenchDrainSystems.com – I excitedly clicked through thinking I would soon be viewing the website of a great French Drain Systems company who could then help me solve my drainage problem. Clicking through to both of the top two results landed me on the same parked page. Having seen a variety of spoofs occur on Google Maps particularly within the user content sections of business listings, I assumed this was the case here too. 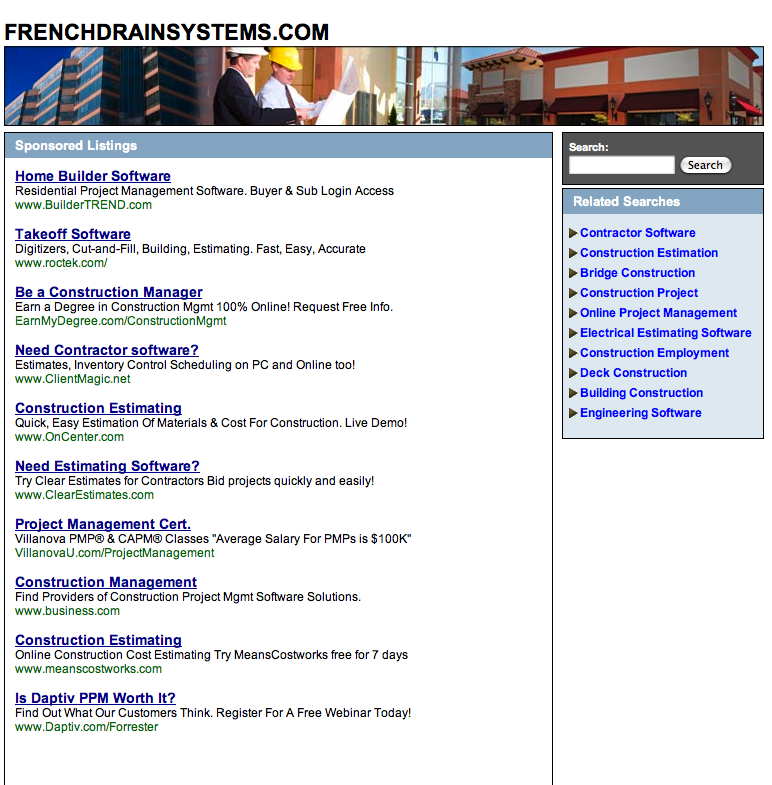 Looks like a local company – although not one in the French Drain Systems business – owns FrenchDrainSystems.com. Apparently, they claimed their listing with either a previous website and then elected to display the parked page or the claimed their listing while using a parked page. Either way, whether this was an innocent attempt at claiming some local search real estate with a parked domain or not, I don’t think the search results are what Google Maps had intended for its users to find. Today I saw an ad in my local newspaper for a new product they have launched called the Business Resource Center. The new service appears similar to Google’s Local Business Center and looks like it provides all of the same features found in the Local Business Center. Anything that you’d traditionally look for in the print yellow pages has become a “local search” on the Internet. For these queries, 75 percent of the top 100 keywords are non-branded, indicating that a majority of consumers have not decided on a specific brick and mortar store to do business with. The site claims “to stay on top of the internet so you don’t have to” and plans to provide the latest in local search, social networking, search engine marketing and social media optimization to its advertisers. The newspaper’s local business resource center will provide advertisers with statistics like Google’s Local Business Center has begun providing in the US. Like Google, the paper’s local Business Resource Center also lets advertisers “create and manage coupons and special offers to drive traffic and build customer loyalty”. 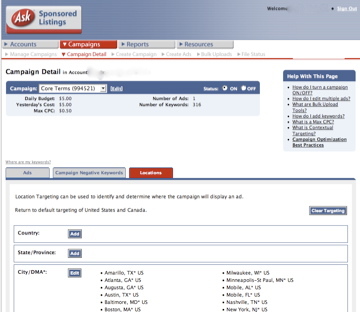 Similar to other directory and listing services, the newspaper’s business resource center alerts advertisers immediately when individuals rate or review their services, and allows them to reply directly to concerns or praise, giving businesses the ability to create stronger relationships with their customers. The Beta version of their User Interface is clean and user friendly. The site offers what appears to be primarily display advertising under keyword or category searches and claims to provide the largest local search audience reach. Overall the newspaper’s launch of a Local Business Center is quite an accomplishment for any newspaper in this day and age. 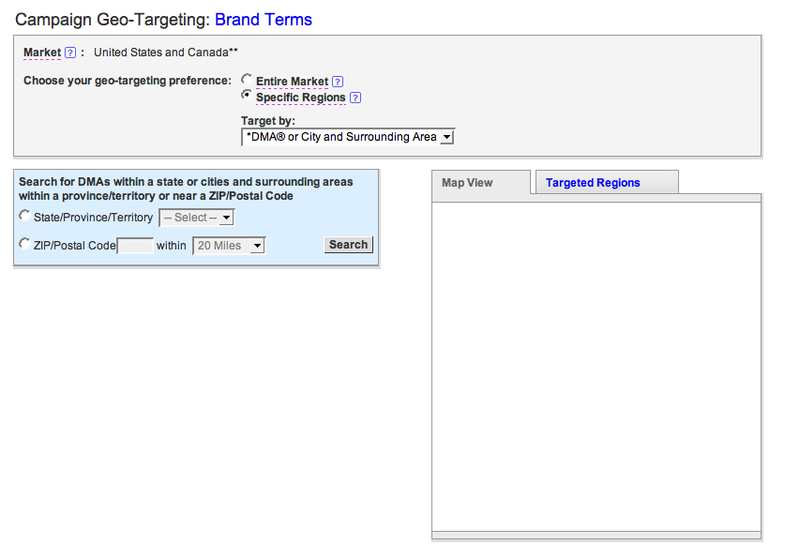 I was giving a presentation in Utah last week using Google Local Search and Google Maps as examples which evidently included new distribution points for Adwords advertising. 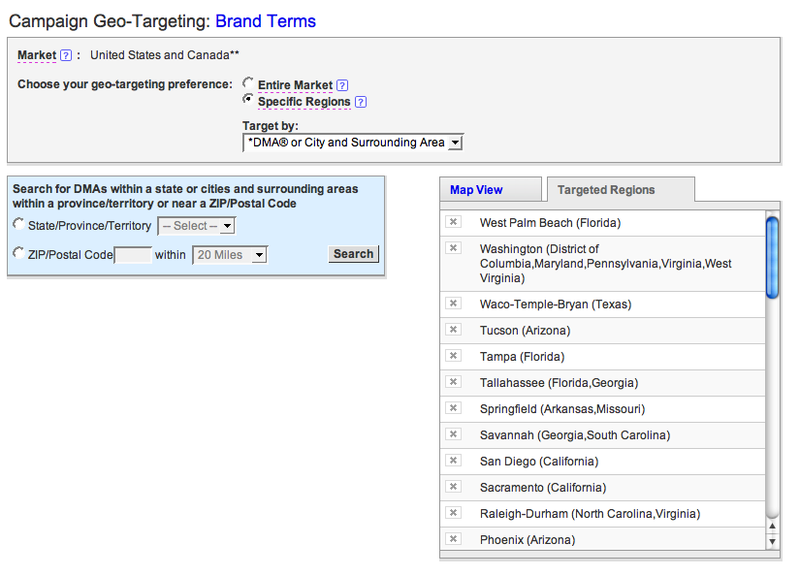 In the examples below, you can see an Adwords ad displayed in two locations in both types of Google Maps products being searched. 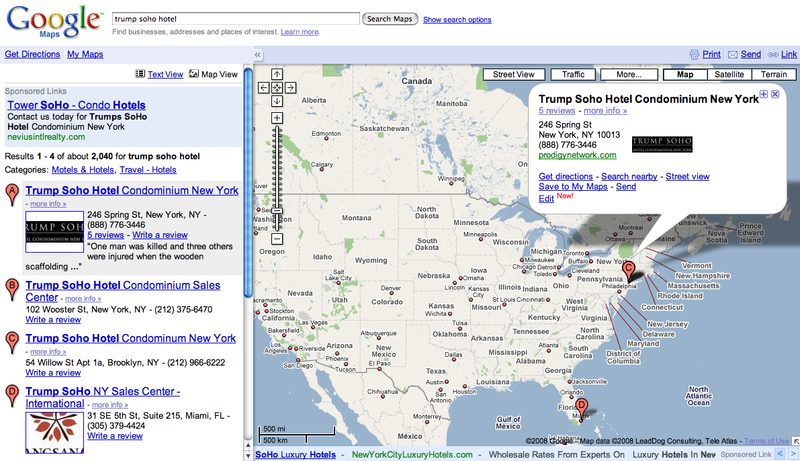 A search for Trump Soho Hotel in Google Maps produces two Adwords advertisers ads – one in the top left corner above Google’s local search results with the other ad below the map itself. 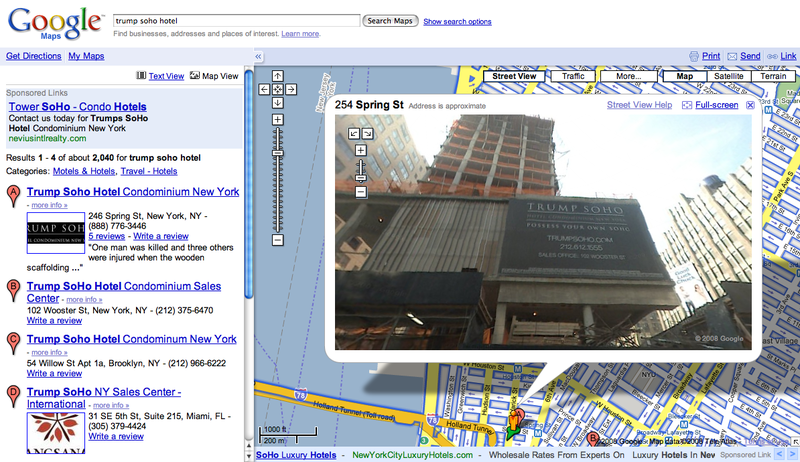 The same search in Google Street View also generates two Google Ads in the same locations as in the Google Map view search. Its not clear to me as a Google Adwords advertiser just how I can get my ads distributed and displayed in these local map search results. None of my geo-targeted Adwords campaigns are generating these types of ad distribution results. I was cleaning up some Yahoo Search Marketing accounts this morning and was trying to find Yahoo’s Search Submit login page. 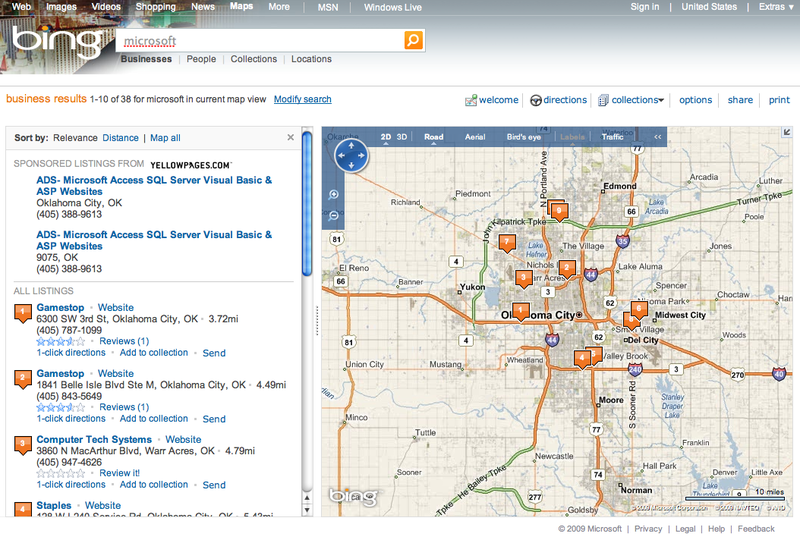 In the past, keeping track of all their search product offerings was difficult. 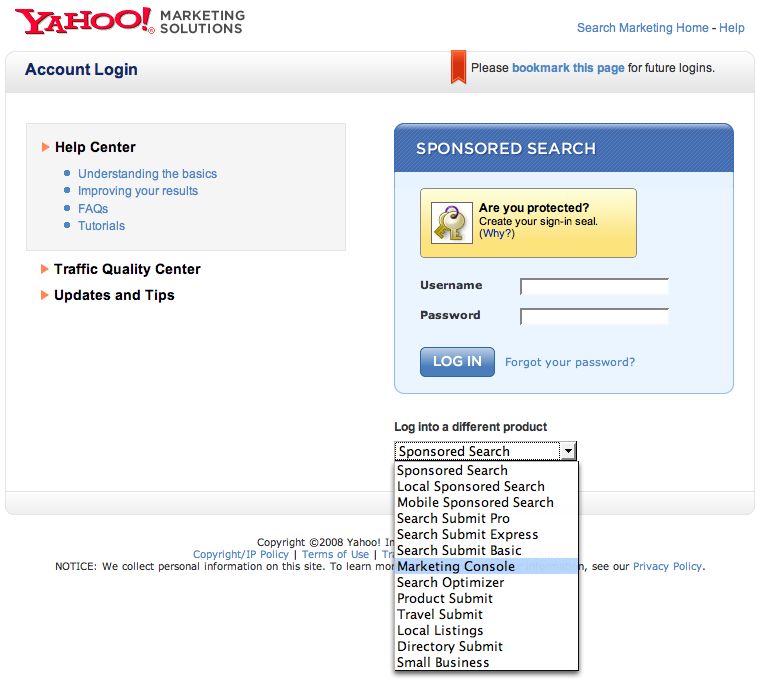 Yahoo has consolidated all of their search marketing products into a drop down box on their Sponsored Search login page. I thought I would get reacquainted with Yahoo search marketing products so I clicked on their “Marketing Console” thinking this would somehow let me manage all of my Yahoo search marketing products in one dashboard. 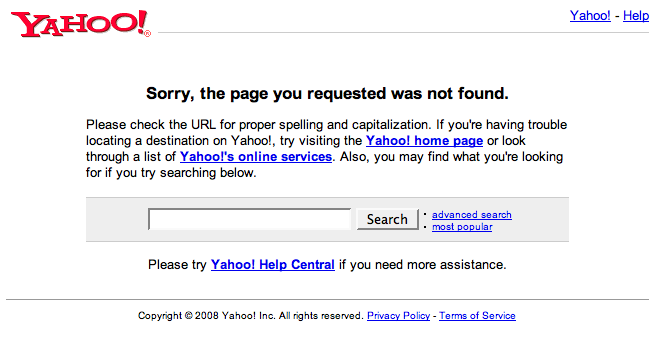 When I clicked on the Yahoo search marketing console I was sent to a non-existent page. I then searched for the Yahoo search marketing console – in Yahoo – and was directed back to their sponsored search login page. Did Yahoo have a search marketing console for managing all of their search products and I just wasn’t able to locate it? 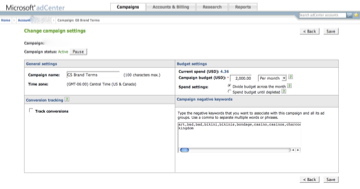 Or, did Yahoo have a marketing console they have since abandoned?